UVLA has been providing FREE civil legal services to seniors 60+ of Montrose, Delta, Ouray, Gunnison, Hinsdale, and San Miguel Counties and low-income residents of Montrose, Ouray, and San Miguel Counties since 1986. We provide a wide range of services to those that qualify including; legal advice, representation, mediation and negotiation. Each month, we also offer two free legal advice clinics that can help clients represent themselves in family law cases. 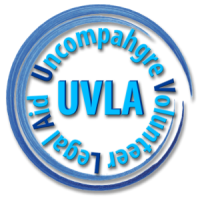 UVLA cannot provide services for a variety of cases including criminal cases, fee generating cases (such as personal injury) or traffic disputes. See our full range of services. Our staff consists of an Executive Director, Program Coordinator and an Intake Coordinator serving our community with enormous help from many volunteer attorneys and paralegals. UVLA receives funding from local governments, bar associations, community foundations and the Area Agency on Aging in Region 10. Financial eligibility for applicants is determined by federal poverty guidelines. Seniors 60+ are eligible regardless of income for limited assistance. If you contact us by telephone, we’ll conduct a short interview to help us determine if you qualify for the next step. You may also use our online forms to see if you qualify; within 3 business days a staff member will contact you. INTEGRITY – we are honest, ethical and accountable in our endeavors. PROFESSIONALISM – we pursue excellence with our creative, courageous and zealous local volunteer attorneys. TEAMWORK – we value our diverse strengths, we cooperate with our clients, staff and community justice partners. COMPASSION – we are caring, empathetic and respectful.